The St. Lawrence River is one of the most dangerous maritime routes to navigate on the planet. During the winter months, the Canadian Coast Guard icebreaker plows endlessly up and down between the Atlantic and Montreal to clear a passage for cargo ships. For three months we followed the daily lives of the crews of the Amundsen, one of Canada’s biggest icebreakers. The task of its crew is to free cargo ships trapped in the ice. However, the St Lawrence is not just a vital artery for the economy of Quebec, it also provides a formidable, open freedom for those who live along its banks. We present a veritable epic ice adventure. 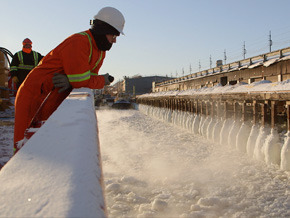 A winter in Quebec with the ice-mad fans of the Saint Lawrence.